It is common among sports teams to rally behind a phrase or mantra throughout the season. Something identifiable, if not catchy, that serves as a way to regain focus or pick up the intensity in times of need. While the Issaquah soccer team is like most teams in that sense, they have more than a mantra to provide inspiration during another deep playoff run. The Eagles will be rallying around former teammate Claudia Longo, who now paces the sideline as an assistant coach in 2018. 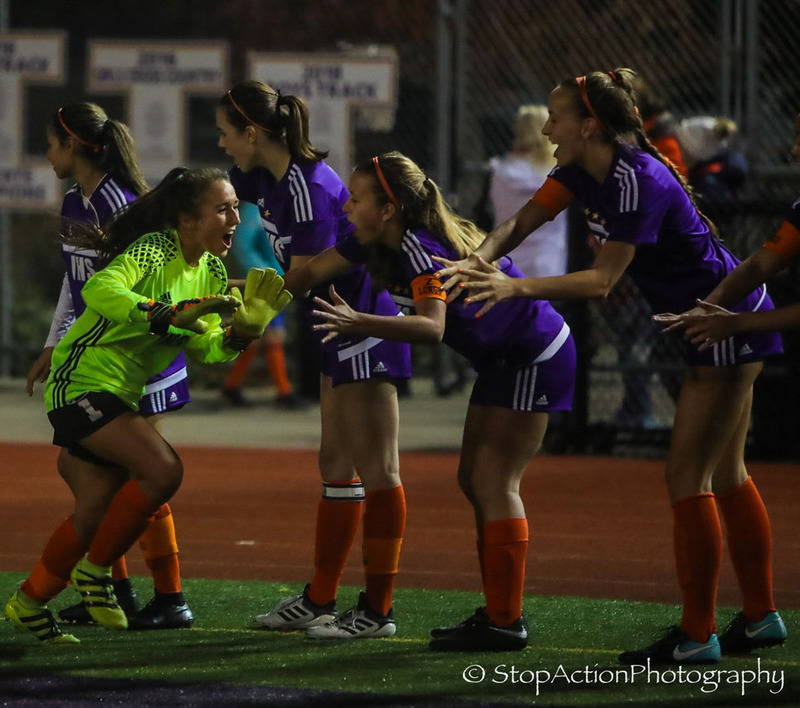 Longo was a member of the storied Issaquah soccer program and played a key role in the team’s fifth State Championship last year during her senior season. The two-year Issaquah Captain received a scholarship to continue her career as a member of the University of Washington women’s soccer team. Longo, however, announced last spring that she had been diagnosed with Multiple Sclerosis (MS), an unpredictable and often disabling disease of the central nervous system. 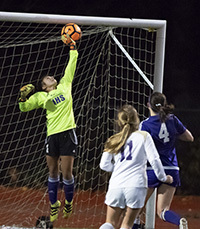 The soccer standout long provided inspiration for the Issaquah soccer program with her leadership and play on the field. Not much has changed since she’s taken up her post on the sideline. Lang, one of a handful of returning players from a senior-loaded team in 2017, was moved to show her support for her teammate and all those who suffer from MS. With some help from her mother, Rena, Issaquah Athletic Director Luke Ande, and many others in the Issaquah community, Lang set out to organize a charity fundraiser to raise money and bring awareness to the Multiple Sclerosis Foundation. “(Claudia) has been a huge part of my life and a huge inspiration to me and to the Issaquah soccer community as well,” Lang said. While balancing her time on the field, where she has started in goal during the team’s postseason run, with her time in the classroom, where she holds a 3.95 GPA, Lang spearheaded the fundraiser which culminated in a tribute match during the District semifinals. The plan required a lot of teamwork and organizing considering the span from inception to execution was less than two weeks long. Not to mention remaining compliant with fundraising in the high school setting raises its own challenges. But Chloe and the Issaquah HS staff were ready for the challenge. “When I first heard about Claudia and trying to help out - it was an instant yes – we need to make this happen,” Ande said. Throughout the week, the team sold merchandise donated by community members and the MS Foundation. On the night of the match, the Eagles took to the field clad in orange socks and armbands to signify their support for MS awareness. 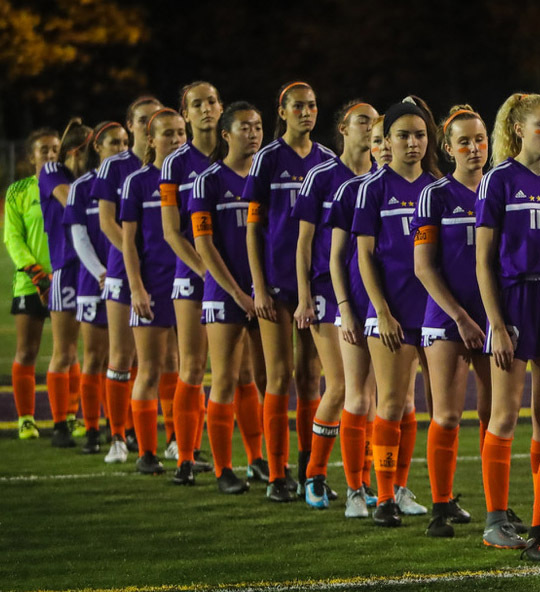 At halftime, members of the UW soccer team helped collect donations in the stands during a “Miracle Minute.” All-in-all, the Issaquah community showed their support for Longo and a worthy cause to the tune of raising more than $8,600 in the short timespan. “It was very cool to see the community come around and support Claudia in any way that they could,” said Lang. Now Issaquah will turn its focus to the defense of a State Title with a semifinal match and potential Championship match at Sparks Stadium in Puyallup, Wash. Lang, who plans to attend George Fox University to play soccer next year, will look to anchor an Eagles defense that has given up only one goal in the last six matches and six goals all season. Regardless of the outcome she says playing on this team during her senior season has been a great experience. WIAA student leadership committee. Sophomores: applications accepted in the spring. $5,000 scholarship opportunity for graduating seniors. Apply November 1-April 1, 2017. 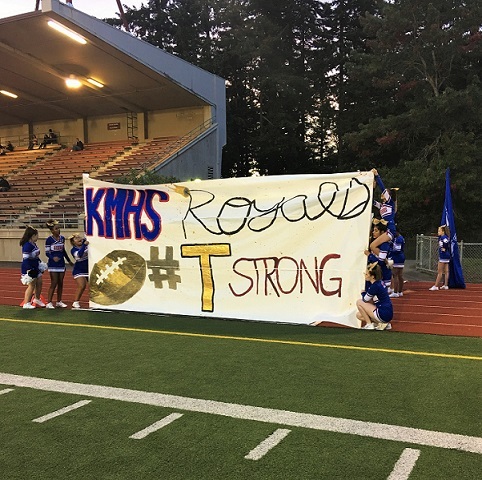 While sports are a natural arena for rivalries and competition, the Kent Meridian Football and Cheer programs have used this season as a chance to promote unity and sportsmanship throughout the North South Puget Sound League (NSPSL). The Royals cheer squad and football team brought attention to Childhood Cancer Awareness month this September by implementing a "#TaylorStrong" awareness campaign. A member of the KM coaching staff has a family friend whose son Taylor was diagnosed with terminal cancer. The “T-Strong” campaign was started to support his fight. Taylor loves to watch student-athletes in uniform under the Friday Night Lights. These student-athletes have become heroes to Taylor, and the KM Royals have chosen to show Taylor how many “heroes” he has here in Washington State. Amidst the fiery emotions that come along with competition, Kent Meridian and its opponents have created space for cross-team camaraderie and uniting for an altruistic movement. Throughout the season, visiting coaches and players from schools such as Auburn Riverside, Hazen, Kentlake and Mt. Rainier have participated in the campaign by joining the Royals at the 50-yard line for a pre-game photo. “This campaign has made so much of an impact that the new slogan for every game is to be “T-Strong," said Wolfskill and Spalti. The KM Royals hope to use “#Taylorstrong” as a symbol of awareness for all students, regardless of their challenges, and to show that no matter what happens on the field, it's what you do off the field that can really make a difference.